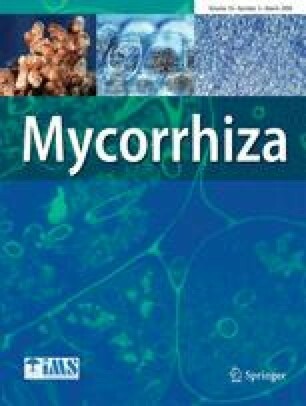 Root colonization by arbuscular mycorrhizae (AM) and dark septate endophytic (DSE) fungi in nitrogen amended and unamended mixed tallgrass prairie communities were analyzed monthly over two growing seasons. Roots were stained with Trypan blue and Sudan IV and fungal structures quantified using the modified magnified intersections method. Root length colonized (RLC) by DSE exceeded AM colonization during early part of the growing season. Fungal colonization varied among the years and was greater in 2003 than in 2002. Seasonal variation among the months within a growing season was observed in 2002 but not in 2003 for both AM and DSE. AM fungi were most abundant during the peak growing season of dominant C4 vegetation while DSE were most abundant during the early part of the growing season. Hyperparasitism of AM hyphal coils by melanized septate fungi was frequently observed and increased with AM coil frequency. Although nitrogen amendment had altered the plant community composition, it had no impact on the colonization by AM or DSE fungi. This work was supported in part by NSF DEB-0344838 to AJ. Konza Prairie Biological Research Station (KPBS) maintained the field sites and was supported by National Science Foundation Long-Term Ecological Research (LTER) program. We are indebted to Dr. Loretta Johnson for access to the long-term N-amendment experiment. Dr. John Walker and Justin Trowbridge helped with sampling. Drs. Charles Kramer, Bill Bockus, Ned Tisserat, and John Walker provided helpful comments to earlier drafts of this manuscript.